If you’re tired of constantly trying to untangle your headphones, charging wires, and electrical cords, reusable rubber twist tie is a must have for you. It helps you get everything organized with a simple wrap and twist motion, making it perfect for use in the garage, on the boat or around the house. Once you use it, you won’t know how you lived without it. Tired of tangled cables? Turn to the Nite Ize Reusable 3-Inch Rubber Twist Tie. Featuring fully bendable wire interior and colorful, durable, soft rubber exterior, the gear tie is perfect for keeping computer cords, headphones, and ear buds bundled and untangled. It is waterproof and safe for use in fresh or salt water without damage. Can use in the garage, car, on the boat, or around the house to keep anything and everything secure and organized. Finally, a perfect solution for all your cord management needs. The EliteTechGear Twist Ties are durable, colorful, reusable, water-proof and won’t scratch or mark. 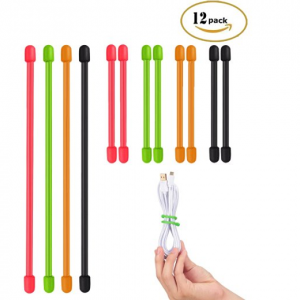 Made with a soft rubber silicone exterior with a bendable wire interior, these twist ties are suitable for both indoor and outdoor use. Easy to use, simply twist them, tie them, and then reuse them. So order yours now to organize you life. Say goodbye to tangled cords and unorganized drawers. You can stay organized wherever you go with the Acrodo Rubber Gear Ties. 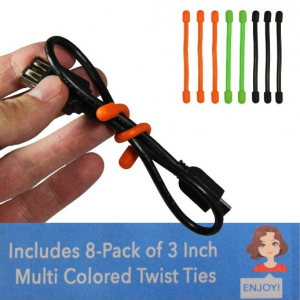 Perfect for organizing your home and garage, school supplies, backpack, or during your travels, these twist ties feature a waterproof exterior and premium wiring for both indoor and outdoor use. 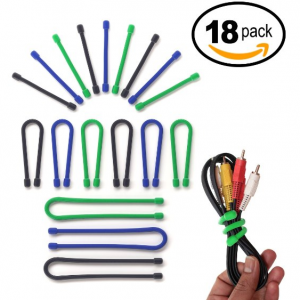 Set includes three 12″ ties for heavy-duty wires, six 6″ ties for TV cables and laptop chargers and nice 3″ ties for headphones wires and phone charging cords. Looking for a cord management idea for your tangled cables? Get the Lizber Rubber Twist Ties. These silicone twist ties are reusable and long lasting. You can use them in home for electronics, kitchen appliances. outside for garage, garden, boat. 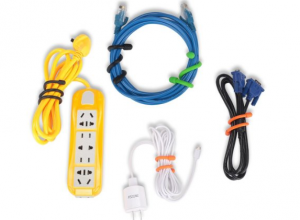 They can tie up cords, wire, cable and more and are perfect for everything that needs to be secured and organized. Includes two kinds of sizes: 3 Inch of 9 PCS, 6 Inch of 9 PCS. 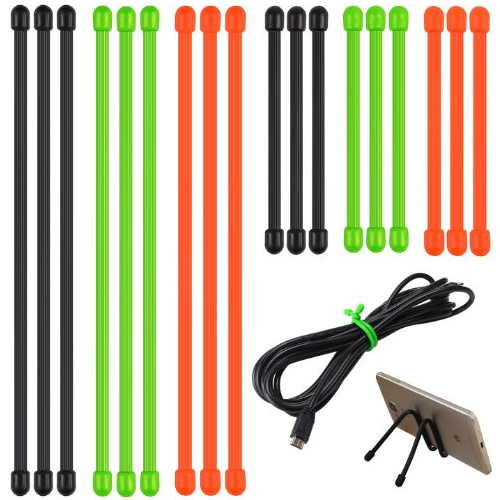 Keep the cables from getting tangled in an easy way with the RoryTory 8 pc Flexible Multi-Purpose Strong Silicone Rubber Tie Set. This set comes with 8 multicolor ties. Ties are made with a strong, flexible, inner wire, which can bend and hold strong in a variety of situations. The rubber coating is waterproof and UV resistant to withstand the elements. Perfect for use around the house, work, garage, boat, indoor, outdoor, etc. 8 Best Cable Box – Key solution for your cable management needs.